I wanted to drop you both a note to thank you so much for all your efforts throughout the build process. It was a journey we thought would be almost impossible considering our lifestyle of constantly moving around the world! However you both thoroughly met our expectations and more from the very beginning to still continues. David, it has been an absolute pleasure dealing with you throughout the process. I have really appreciated you taking the time and patience to explain things to me whenever necessary. To throw ideas back and forth regarding the construction, design, practicality and versatility of the our home. I was always so excited and thrilled about each stage of the building process and so looked forward to my visits to Melbourne to see our home. I couldn’t ask for a more solid and sound constructed modern home, thank you. Maryanne, my family have told me that the design, colors and textures in the house are absolutely magnificent in real life, as they appear in the photos! Importantly too, that the house feels like a “home”, as per our original brief. A place that feels warm, welcoming and stylish. A true success and I couldn’t have done it without your guidance and support so thank you so much. I can’t wait to see it! Thank you both also for being so available, patient and helpful whenever required, it really made the process that much easier for me knowing that I was able to brainstorm, have hearty discussions and finally make the decisions that felt right to me/us whether it be large or small. We can’t wait to eventually move into our home. A big thank you to the DDB team." We are still so overwhelmed with excitement. So happy with our home. Thank you." We would like to thank you wholeheartedly for creating such a beautiful home for our family. It is unbelievable to think that we are finally living in our dream home. Please convey our thanks to your staff, as they helped ensure that we had a very positive experience during the last 12 months." I’ve been meaning to send this email for a while now, but typically life has been hectic and it’s taken a while. I just wanted to thank you for your input, recommendations and advice throughout our renovation. I’ve said to many people that that your fee was the best money we spent across the entire project. I absolutely love the master ensuite (and I wasn’t convinced that would happen! ), the girl’s ensuites, and the kitchen/living areas in particular. The timber flooring has been a huge hit. We have certainly created a ‘wow’ factor based on the response from friends and family. I look forward to catching up with you again when I’m ready to get advice on the soft furnishings and lighting for the front areas. At the moment I think I need to take a little break from it all. Let me know how you go with the linen drape fabric quote – no hurry! I’m still awaiting shutters at this stage! Red Textas has been the building surveyor for DDB Design Development & Building Pty Ltd for the last 17 years. We have been appointed as the Relevant Building Surveyor for most of DDB’s residential building projects during this period. David McCallum, as the registered builder and Managing Director of DDB Design, has personally managed each of their building projects and has always demonstrated a high level of competency in all areas of residential building including basement and multi-level construction. David has displayed a very good knowledge of the building permit process; including relevant Building Regulations, Codes and Standards. I confirm that we support his application to increase his insurance limit for multi-unit developments and believe he is capable of carrying out larger jobs, including the project at 60 Simpson Street, East Melbourne." "Davey Architecture Studio has had a very close working relationship with David McCallum and DDB / Design Development & Building for the last 20 years. We have worked with David on numerous projects and found him to be a professional and dedicated builder. His enthusiasm and professionalism ensures the project is completed on time and to the highest quality within budgetary constraints. David shows great interest in every project and client, his attention to detail is paramount throughout the whole project, he understands the architectural intent and client desires behind the drawings bringing a quality to the build you can not only see, but also tangibly feel. David is experienced in boutique and unique architectural homes through to the more complex multi unit residential developments and I unreservedly recommend DDB and their team." "As an established Landscape Designer we have been blessed over many years to work in and around beautiful architecture, stunning interior designs and the highest quality of workmanship throughout Melbourne and Australia. There is nothing better than to be presented a project that already offers great form, bones and scale which we can build on and compliment from an exterior perspective. However, without the shared commitment and passion for the exterior zones, the best buildings can be let down with an inferior landscape design as these spaces are not often prioritized or sufficiently valued by other stake holders. Working with David and the highly skilled team at DDB has always been a refreshing collaborative and exciting opportunity where our concepts, passion and vision for landscape elements, in and around their stunning homes, has always been thoroughly embraced, supported and more importantly executed as one of the key elements of every project. In today's world, all elements of a project need to mould as one, be intrinsically connected and blur the lines between inside and out. 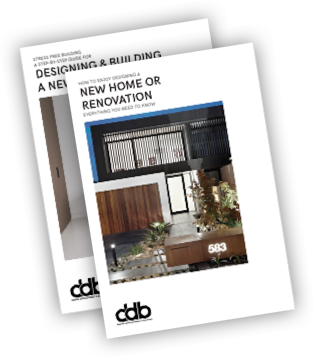 It is only then that you create a complete home experience and I firmly believe that this is DDB's greatest signature, bespoke, beautiful, functional homes from inside to out, the complete package. We thoroughly love working alongside David and his team where their excellence and exacting standards push us to be better with everything we do and we look forward to many more successful projects together in the future."